Ok, first of all, let me make this clear. I am not giving up on the MP3 Player just yet. I’ve decided to work on a simpler project for a while and take a bit of a break from the MP3 player. I’ve had the idea to make this pocketwatch for quite a while, and finally decided to act on it. Here’s the jist of the project. 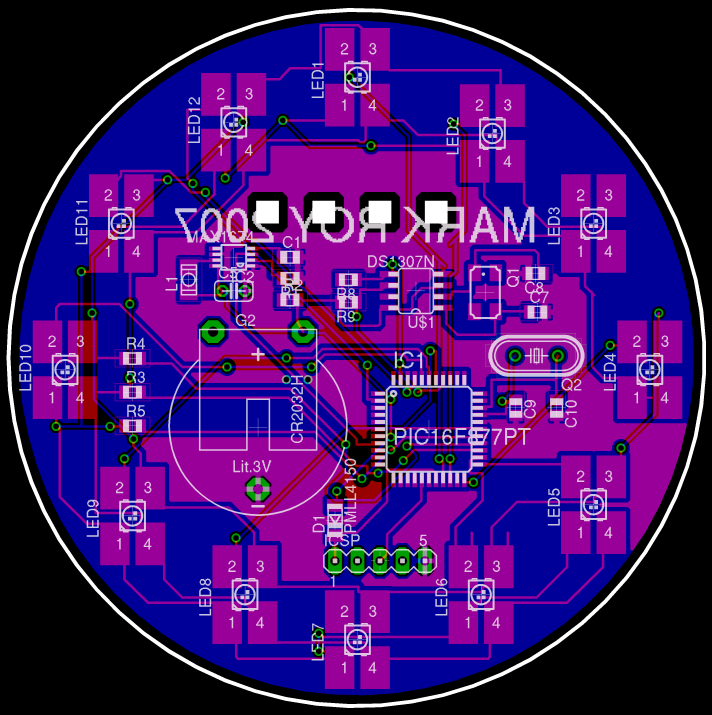 12 RGB LEDs in a clock face (originally I wanted 60, but this proved to be technically not feasible) pattern. If you dont know what an RGB LED is, its basically three LEDs in one package that share a common cathode. With this, you can send three PWM signals to each colour and effectively achieve any colour you can come up with (which is practically limited to around 255 colours). So my plan is basically this, each hand of a clock will be represented by a different colour. As the hands move and overlap, the colours will be added. When a hand is in between numbers, different shades of the colour will be used (for instance, there will be 5 shades that represent the minute hand. At 12:00, the uppermost LED will be lit fully. at 12:01, it will dim a bit and the 1:00 LED will light by the same amount. This progresses until at 12:05 the 12:00 LED is off and the 1:00 LED is on completely). First and foremost, I want to use this as a chance to design and implement a PCB. I think this PCB may be significantly simpler than my MP3 player, and is a good learning exercise. I want to finally get the damned MAX1675 DC-DC converter working. This thing has been causing me nothing but headaches, and I think I’ve figured out why. The silly inductor that is required to begin the resonation that increases the voltage is hard to come by. I’ve tried (and ordered) several different inductors and coils to test this with, none of which worked. Recently, I saw on a website another person using this device with an inductor that is nothing like the tiny ones I’ve been trying. It was a big obvious looking coil of wire. I’ve ordered some more inductors to play with, and I seriously hope I get this solved soon (for both the pocketwatch and the MP3 player). Anyway, thats enough ranting for now. I’ll post more on this later, when I’ve got something cool to show. My first step, is to get a prototype working on a breadboard. I’ve rigged up 9 of the LEDs so far in a grid pattern and hope to get the pic multiplexing different colours to them at a reasonable speed with enough power left to do things like calculate hand positions and read the RTC. Unfortunately the PIC only has 2 PWM channels, which means that I’ll have to come up with my own PWM channels and bit bang them (substantially slower, but it should still be adequate).